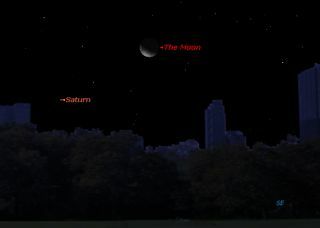 This sky map shows the location of Saturn and the moon in the night sky at 3 a.m. local time on Sunday, Jan. 6, 2013, for observers at mid-northern latitudes. Skywatchers who are out and about after 3 a.m. local time Sunday (Jan. 6) will have an interesting celestial array to admire. Three heavenly bodies will come together to form a stretched-out and inverted triangle low in the east-southeast sky. The planet Saturn will shine sedately with a yellowish-white glow well to the left of the moon, which will be a waning crescent about 36 percent illuminated. Hovering well above and to the right of the moon will be the bright bluish star Spica, in the zodiacal constellation of Virgo. The moon appears to pass Spica every month, but over the past couple of years Saturn has been relatively nearby too. So we have been calling this monthly assemblage tin the night sky the "Saturn Triangle." The side of the triangle from Saturn to Spica (the base) will measure a much longer 18 degrees. The moon will mark the vertex angle. By around 5:30 a.m. Sunday, just as dawn is about to break, the trio will have moved to a point about one-third up in the sky toward the south-southeast. But the appearance of this celestial triangle will also have changed. Saturn is currently 935 million miles (1.52 billion kilometers) from Earth and will not change its position noticeably relative to the background stars during the course of a single night. But the moon is only 229,800 miles (370,100 km) away and as a result will shift its position to the east during the course of the night. In fact, the moon appears to move east against the background stars at roughly its own apparent width (0.5 degrees) per hour. So, only 2.5 hours after the triangle’s first appearance, the moon will have appeared to move about 1.25 degrees farther away from Spica, placing it noticeably closer to Saturn. If you have a telescope, check out Saturn's rings. Back in the late summer of 2009, Saturn’s rings were all but invisible to us because they were turned nearly edge-on toward Earth. Now, however, they are tilted 19 degrees toward us and are readily seen with magnifications of 30 power and up. Editor's note: If you snap an amazing photo of Saturn and the moon, or any other night sky view, and would like to share it with SPACE.com, send images and comments, including name, location and equipment used to managing editor Tariq Malik at spacephotos@space.com. Joe Rao serves as an instructor and guest lecturer at New York's Hayden Planetarium. He writes about astronomy for The New YorkTimes and other publications, and he is also an on-camera meteorologist for News 12 Westchester, New York. Follow SPACE.com on Twitter @Spacedotcom. We're also on Facebook & Google+.